Today is my birthday. It also happens to be my sister's birthday. No, we're not twins. She was born on my 6th birthday [evidently I told my mom I'd have preferred a truck]. Some people think having to share a birthday is a drag because they only get half of the spotlight. Quite to the contrary, I always felt that made me special, and that in a family of five children, that my sister was special to ME. Indeed she is, but not in the "special olympics" sense. So today we celebrate our birthdays. We live far apart so we will have to make do with a phone call. She always identifies herself as "your sister" which is specific because she is the only girl, but it still strikes me funny. After a week in the NICU, Luke finally was feeling well enough to come home. "Well enough" is sort of an understatement based on how much he has been eating. Just 16 days ago, he was born weighing in at exactly 8 pounds. Newborns normally lose a little weight at first, but the rule of thumb is that babies should be at their birth weight within two weeks. 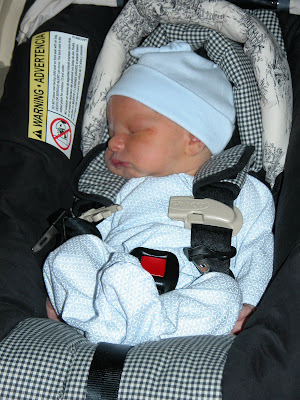 Well, our not-so-little boy now weighs 9 lb, 10 oz, a whopping 20% increase since his birth! Wow. The nurses at the NICU, who are normally used to dealing with preemies, were amazed at his appetite, and warned us that he would eat us out of house and home when he becomes a teenager. We can only hope. We thank God that he is well and home.